A non-refundable 30% deposit is payable on booking with the balance payable eight weeks prior to the commencement of the letting period booked. The deposit is returnable if the booking is not accepted. A confirmation of your booking will be issued upon receipt and full directions will be sent upon receipt of the full payment. If we should need to cancel the booking we will refund in full all monies paid to us by you. Responsibility and financial liability of Smugglers Rock shall be limited to the return of monies received in the event of accommodation booked in good faith not being available owing to circumstances beyond our control. Should you need to cancel with less than eight weeks to the date of the booking then you will be bound by this agreement to pay us in full for that booking. Payment must be made whether or not you have at the time of cancellation paid in full for the booking. You would therefore be advised to take out holiday cancellation insurance to cover you for that eventuality. Accommodation will be available to you from 4.00pm pm the start date of the booking. If you intend arriving later than 6.00pm, then you must advise us. Smugglers Rock accepts no liability for any claim arising out of delayed arrival to the holiday property, or cancellation of the holiday by the holidaymakers due to adverse weather conditions that prevent travel to the holiday property, temporarily or at all. Accommodation must be vacated by 10.00am at the end of the stay; this allows for cleaning and maintenance to take place. Smugglers Rock will provide the accommodation to a high level of cleanliness and accommodation must be left in the same clean and tidy condition as you found it. A cleaning charge of £30.00 will be made should the cottage be left uncleaned or below this standard. Any problems found with any appliance or fixture or fitting must be reported to us as soon as possible in order to ensure that within a reasonable time it is repaired or alternative arrangements made. Under no circumstances should any guest attempt repairs to the property or its contents. This will invalidate service contracts, warranties and agreements and charges for such repairs will then pass to the Hirer. The Hirer undertakes to keep the premises and all furniture, fixtures, fittings and effects in or on the premises in the same state of repair and condition as the same are in at the commencement of the letting and shall report and pay to the owners the value of any part of the premises, furniture, fittings and effects so destroyed or damaged as to be incapable of being restored to its former condition. Only the number of guests stated at the time of booking will be allowed to stay in the property, unless otherwise agreed prior to arrival by the owners. Smugglers Rock reserves the rights to refuse entry to the entire party if this condition is not observed. You cannot arrange for visitors to the property without the advance consent of Smugglers Rock, and you must not hold parties, celebrations or gatherings at the property. Smugglers Rock reserves the right to decline entry and accommodation or to expel any occupier or visitor for conduct which in their sole view is detrimental to the premises or the comfort of other visitors. Smugglers Rock reserves the right to enter a property at any time but will endeavour to do so when convenient to the occupier. Smoking is not permitted in any of our cottages.. Smugglers Rock is not to be held responsible for the loss of any valuables or property left on or around the premises at any time. All guests, their friends, families and visitors must ensure that they take all reasonable steps to ensure their own safety and that of others whilst on the property, the owners will not accept responsibility for any injury or loss caused whilst in or around the property. We allow up to 2 dogs which are only accepted by prior arrangement. Any agreement to allow dogs into the property is conditional on the points below. Your dog must be over 6 months old, fully housetrained and will not cause any damage to the property. Your dog is not left unattended in the cottage when you go out. You exercise your dog off the premises and do not allow your dog to foul the garden. For the consideration of other guests, dogs must be kept under strict control at all times and not be left in the property unattended at any time. Failure to comply will render the contract terminated and you may be asked to remove the dog(s) from the premises. Any excess cleaning required will result in an extra charge being passed onto you. It has unfortunately been necessary to reiterate the above conditions and bring them to the attention of all guests bringing a dog on holiday with them to the cottage. If you feel you are unable to comply with ALL of the above conditions, please advise us within 48 hours of booking in order that we may cancel your booking and issue a refund of your payment. 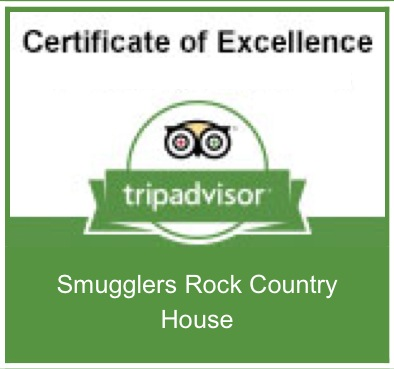 Notwithstanding the above, we look forward to welcoming you and your dog to Smugglers Rock/Cove/View Cottage.